Docile (John T. Gast & Tribe Of Colin) - Docile. Vinyl EP. Bleep. John T. Gast follows a series of KILLER singles for BEB (as JTG and under an alias many have probably not clicked onto yet) and his own 5Gate Temple label with Docile, a fresh collab with his fellow mysterious man of the moment musician Tribe Of Colin. While rumours did circulate for a while that JTG and TOC were, in fact, the same person, it turns out they are not! Docile however is the first in what we hope is an ongoing collaboration between the two. 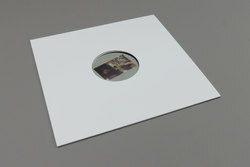 Docile 7 is what the more rugged end of UK techno would sound like if it spent more time browsing Hard Wax's classics section. Empty Fury is pure out and out grime, built for maximum damage all the way from the icy string section to the low-fi keys that dance around the militant drum beat, while both close in on the haunted steppers interlude Jonah Reprise, leaving us stranded and on a seriously cold tip. While it is a pricey 12, trust us and give it a spin, it's absolutely lethal in every way.